In Nigeria, numerous businessmen had dominated the scene and faded off on account of the unstable business climate but there are those who have consistently remained prominent. This may probably be as a result of their great business acumen. Publisher, Jimmy Enyeh x rays 10 top businessmen who are still making waves and have weathered the storm in spite of being in business for decades. 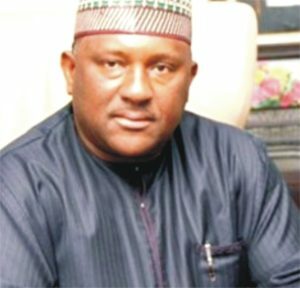 This Kano State born businessman is reputed to be the richest man in Africa. He was born on the 10th of April 1957. Dangote is the brain behind ]Dangote Group of Companies which has interests in commodities. The company operates in Nigeria and other African countries, including Benin, Cameroon, Ghana, South Africa, Togo, Tanzania, and Zambia. As of January 2015, he had an estimated net worth of US$18.6 billion. Dangote is ranked by Forbes magazine as the 67th richest person in the world and the richest in Africa. H]e peaked on the list as the 23rd richest person in the world in 204. He surpassed Saudi-Ethiopian billionaire Mohammed Hussein Al Amouldi in 2013 by over $2.6 billion to become the world’s richest person of African descent. His penchant for business started when he was growing up. According to him “I can remember when I was in primary school, I would go and buy cartons of sweets [sugar boxes] and I would start selling them just to make money. I was so interested in business, even at that time[.. this passion later culminated into the establishment of the Dangote Group, a small trading firm in 1977. Today, it is a multi-trillion naira conglomerate with many of its operations in Benin, Ghana, Nigeria, and Togo. Dangote has expanded to cover food processing, cement manufacturing, and freight. The Dangote Group also dominates the sugar market in Nigeria and is a major supplier to the country’s soft drink companies, breweries, and confectioners. The Dangote Group has moved from being a trading company to being the largest industrial group in Nigeria and includes: Dangote Sugar Refinery Dangote Cement and Dangote Flour. In July 2012, Dangote approached the Nigerian Ports Authority to lease an abandoned piece of land at the Apapa Port, which was approved. ] He later built facilities for his flour company there. In the 1990s he approached the Central Bank of Nigeria with the idea that it would be cheaper for the bank to allow his transport company to manage their fleet of staff buses, a proposal which was also approved. Dangote has diversified into telecommunications, and has started building 14,000 kilometres of fibre optic cables to supply the whole of Nigeria. As a result, Dangote was honoured in January 2009 as the leading provider of employment in the Nigerian construction industry. On 14 November 2011, Dangote was awarded Nigeria’s second highest honour, the Grand Commander of the Order of the Niger (GCON) by former President Goodluck Jonathan. In 2014, the Nigerian government said Dangote had donated 150 million Naira (US$750,000) to halt the spread of ebola. In May 2015 Dangote expressed interest in purchasing the English football team Arsenal. He stated that if he was able to make the purchase he would fire the club’s long-standing manager Arsene Wenger. Abdulsamad Rabiu, is a billionaire businessman who has his hands in manufacturing, real estate development, agriculture, oil and gas, and shipping. His net worth is $1.2 billion. He is the chairman and CEO of BUA Group, a privately-owned conglomerate with annual revenues estimated at $2 billion, and interests in manufacturing, port concessions, real estate development, oil & gas and shipping. The handsome and level headed Rabiu, is the son of well known businessman, Khalifa Isiaku Rabiu, (Isyaku Rabiu has four wives and 37 children. ), who made a fortune in trade and industry in the decades after Nigeria’s independence from the UK in 1960. By the 1970s, Isyaku emerged as a key sponsor of the National Party of Nigeria, which became the ruling political party after the country returned to civilian rule following the elections of 1979. A military coup in 1983 toppled the government and led to the arrest of then-President Shehu Shagari and many of his close associates, including Isyaku. Abdulsamad was born on the 4th of August 1960 in Kano. He did his early education and then attended Capital University in Columbus, Ohio and returned to Nigeria at the age of 24 to oversee family business at a time when his father was detained by the administration of General Muhammadu Buhari on allegation of duty aversion on rice imports. As a young executive director at the company, Abdul Samad was able to steer the family business out of trouble created by the absence of their father. BUA engaged in the importation of rice, edible oil, flour and iron and steel. In 1990, the then Government owned Delta Steel Company contracted BUA to supply its raw materials needs, for which BUA was paid with finished products. This provided the much needed windfall for the young company. BUA further ventured into steel, billets and iron ore importation and supplying multiple rolling mils in the country. Few years down the line, BUA acquired Nigerian Oil Mills Limited, the largest edible oil processing company in Nigeria and later set up two flour milling plants in Lagos and Kano in 2005. By 2008, BUA broke an eight-year monopoly in the Nigerian sugar industry by commissioning the second largest sugar refinery in sub-saharan Africa. The company went on the acquire a controlling stake in a publicly listed Cement Company of Northern Nigeria in 2009 and commenced to construction of a $500 million cement plant in Edo State to be commissioned early 2015. Abdul Samad Rabiu loves giving back and sometimes uses BUA Foundation for his philanthropic activities. These include the construction of a 7,000 Square meter paediatric ward at the Aminu Kano Teaching Hospital as well as the construction of the Centre for Islamic Studies at the Bayero University Kano amongst several others. This debonair Delta State born businessman is the chairman of Pinnacle Communications Limited, Tarmac Nigeria Limited, Centagon Group of Schools and many other top rated companies. Sir Lucky Babatunde Omoluwa has made a mark in the broadcast engineering sector. Sir Omoluwa has also steered Pinnacle Communications Limited to play significant role in the digitalization process of the broadcasting sector, especially to meet the race of the 2015 worldwide deadline for digitalization of broadcasting. 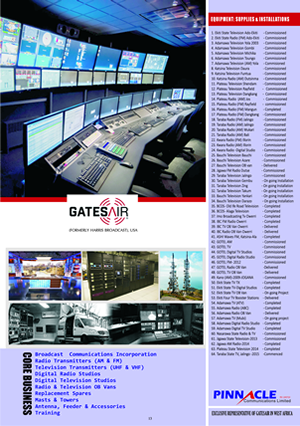 The broadcasting services oof states like Imo, Taraba, Plateau, Ekiti, Nasarawa,, Jigawa, Adamawa just to mention but a few are currently enjoying modern broadcasting technology provided by Pinnacle Communications Limited. Pinnacle has consistently won international awards from Nigeria, Ghana, United Kingdom and USA, among them are the Good Business Ethics from Harris Corporation USA, Outstanding Trade Contribution by US government, Outstanding Commitment to Business by Harris Corporation USA, Support of Trade Development by US government and the Dr. Kwame Nkrumah Outstanding Merit Award in recognition of outstanding contribution and achievements as a businessman in the field of communications. In a rather unprecedented development, Sir Omoluwa was invited to serve as an International Trustee of Religious for Peace at the United Nations in New York last January 2015. He is the first African on the Board of International Trustees to be so appointed. Likable Femi is the son of former Lagos State governor, Sir Michael Otedola He is married to Nana, with three daughters and one son, including the British DJ and socialite Florence “Cuppy” Otedola. 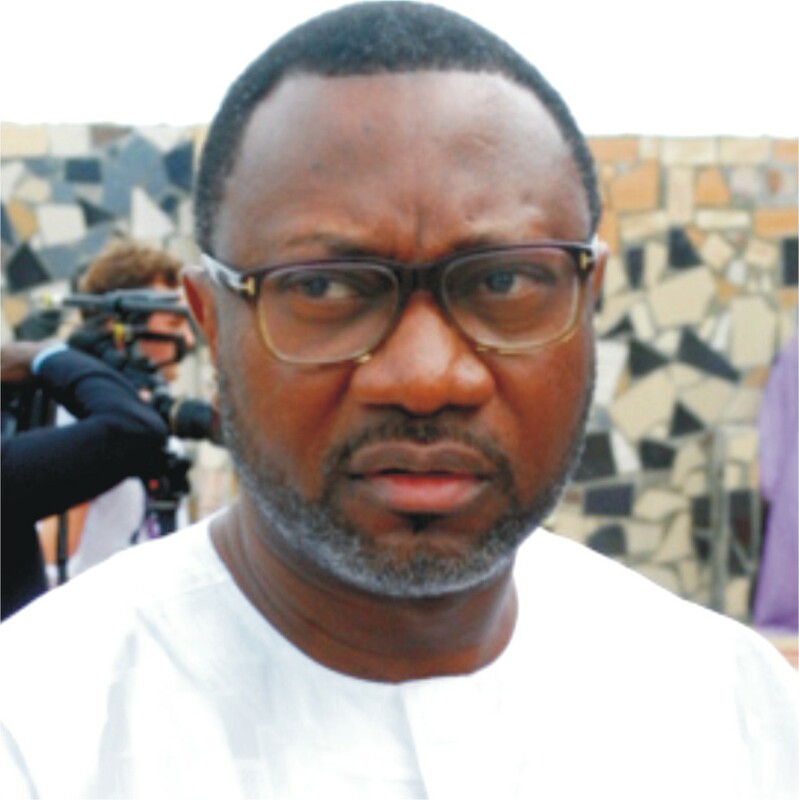 Otedola owns one of the country’s largest oil storage facilities which he purchased for N2.8 billion. He bought one hundred brand new trucks purchased for N1.3 billion to strengthen the distributive arm of his business, and acquired for 6.8 million dollars a massive flat-bottomed bunker vessel with a storage capacity of 16,000 metric tonnes of diesel. His company appeared to have fully prepared itself for the deregulation of the petroleum sector as evidenced in its purchases. Buying three cargo ships in quick succession to bring its total number of ships to four. All are named after his parents and wife. MT Sir Michael (his father), MT Lady Doja (his mother), MT Nana (his wife). His latest is named Zenon. Apart from being the biggest diesel and kerosene marketer in Nigeria today, he is said to be the biggest ship owner in the country, which partly explains his nomination as President of Nigeria Chambers of Shipping, a powerful and highly influential body in the maritime sector. The oil baron and shipping magnate also bought 100 brand new DAF trucks from the Netherlands to strengthen his distribution arm. Zenon now boasts of a total diesel storage capacity of more than 147,000 metric tonnes making it the biggest depot owner with the largest single storage capacity in the country. Otedola is also the owner of Atlas Shipping Agency, Swift Insurance, FO Properties Limited, FO Transport and Seaforce Shipping Company Ltd. He was born on March 22 1963 in Jos and is an economist by training, He has two degrees in economics from Nigerian universities. a bachelor’s degree from the Ambrose Alli University and a master of science degree from the University of Lagos. He is an alumnus of Havard Business School’s Advanced Management Programme. Tony Elumelu married Awele Vivien Elumelu, a medical doctor, in 1993, and they have five children together. He has four siblings including Ndudi Elumelu, a former member of the House of Representatives and governorship aspirant in Delta State. .
A visionary entrepreneur and a philanthropist,Tony is the Chairman of Heirs Holdings the United Bank for Africa, Transcorp and founder of the Tony Elumelu Foundation. He bagged the Nigerian national honours, the Commander of the Order of Nigeria (CON) and the Member of the Order of the Federal Republic (MFR) in 2011. New African magazine listed him as one of the 100 most influential people in Africa and a year later, he was recognised as one of “Africa’s 20 Most Powerful People in 2012” by Forbes Magazine. In his early career, Elumelu acquired and turned Standard Trust Bank into a top-five player in Nigeria. 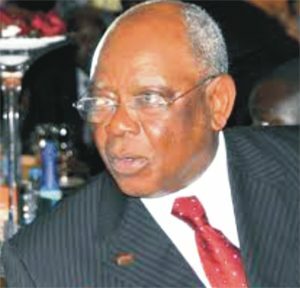 In 2005, his corporate reputation as an African business leader was sealed when he led the largest merger in the banking sector in Sub-Saharan Africa to acquire the United Bank for Africa (UBA). In five years, he transformed it from a single-country bank to a pan-African institution with over seven million customers in 19 African countries. Following his retirement from UBA in 2010, Elumelu founded Heirs Holdings which invests in the financial services, energy, real estate and hospitality, agribusiness, and healthcare sectors. In the same year, he established the Tony Elumelu Foundation, an Africa-based and African-funded philanthropic organisation dedicated to the promotion of excellence in business leadership and entrepreneurship and to enhancing the competitiveness of the private sector across Africa. In 2011, Heirs Holdings acquired a controlling interest in the Transitional Corporation of Nigeria Plc. (Transcorp), a publicly quoted conglomerate that has business interests in the agribusiness, energy, and hospitality sectors. Elumelu was subsequently appointed chairman of the corporation. Elumelu serves as an advisor to the USAID’s , Private Capital Group for Africa (PCGA) Partners Forum. He sits on the Nigerian President’s Agricultural Transformation Implementation Council (ATIC). He is also vice-chairman of the Nigeria Competitiveness Council of Nigeria (NCCN) whose formation he was a key driver in, and serves as Co-Chair of the Aspen Institute Dialogue Series on Global Food Security. He additionally chairs the Ministerial Committee to establish world-class hospitals and diagnostic centres across Nigeria, at the invitation of the Federal Government and the Presidential Jobs Board, engineered to create 3 million jobs in one year. He also serves as a member of the Global Advisory Board of the United Nations Sustainable Energy for All Initiative (SE4ALL) and USAID’s Private Capital Group for Africa Partners Forum. The Foundation deploys its resources to generate solutions to challenges that inhibit the growth of the African private sector. 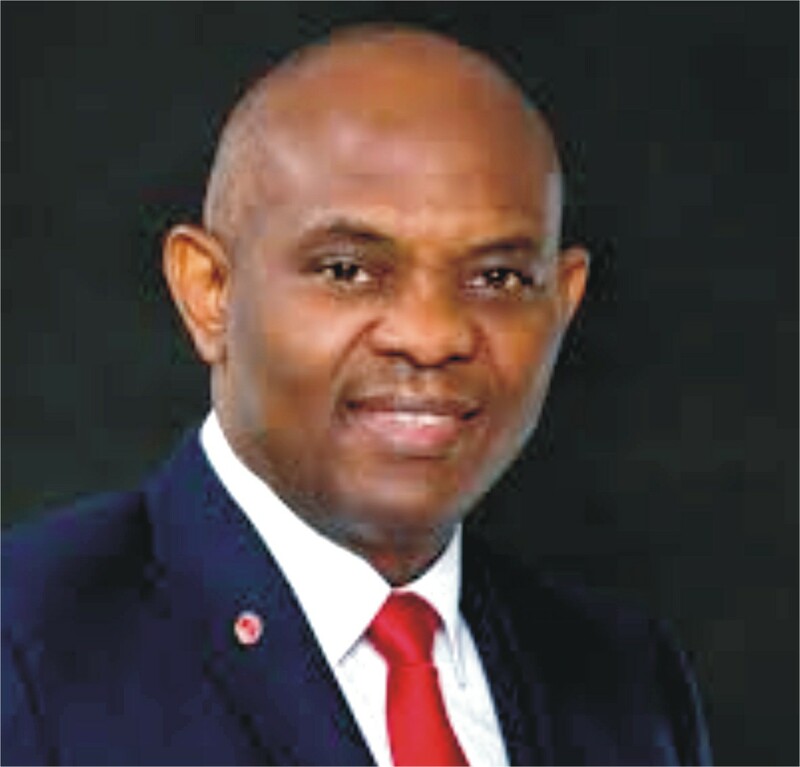 Through its commitment to catalytic philanthropy, the Tony Elumelu Foundation seeks to achieve its mission by enhancing the capacity of African businesses, supporting and driving policies that promote competitiveness, deploying financial capital through impact investments, and educating public and private sector actors through rigorous research. Dr. Stella Okoli, OON is the Founder and Chief Executive Officer of Emzor Pharmaceutical Industries Limited, an indigenous group she founded in 1977, which has remarkably grown to have footprints in Liberia and Sierra Leone. Born in Kano, Northern Nigeria to the family of Chief Felix Ebelechukwu and Princess Margaret Modebelu of Nnewi, In Anambra State, she attended All Saint Primary School, Onitsha from 1954-1959 and Ogidi Girls Secondary School from 1959-1964, Attended Federal Science School Lagos from 1964 till 1966. She later proceeded to University of Bradford in the United Kingdom from where she obtained a Bachelor’s degree in Pharmacy. This academic achievement was followed by an MSC in Biopharmaceutics which she obtained from University of London, Chelsea College in 1971. Dr. Stella Okoli’s post-graduation work experience is quite impressive. Her experience in the Pharmaceutical field is well consolidated. She initially worked in Middlesex Hospital as a Ward/ Clinical Pharmacist, followed in succession by her brief stint as a Pharmacist at Boots Chemist London. Her return home to Nigeria, saw her work at Massey Children Hospital Lagos before she joined a pharmaceutical manufacturing company Park Davies Nigeria Ltd (now Pharma-Deko Plc) as a Medical Representative and later as a sales Manager. when she started, not a few of her friends and colleagues wondered if she knew what she was getting herself into. They had wondered how she could survive the turbulent world of business, particularly manufacturing. But over 35 years down the line, Okoli has not only proved the cynics wrong, she has, in fact, emerged as one of Nigeria’s women billionaires in the business world. From a very humble beginning as a retailing chemist shop in January 1977, the company has now grown to become a leading manufacturer of pharmaceutical products as well as other health and medical products. Born in Kano, northern Nigeria, to Felix Ebelechukwu and Margaret Modebelu, of Nnewi, Anambra State, Okoli bagged a first degree in pharmacy from Bradford University in 1969, following it up with a master’s in Bio-Pharmaceutics from the University of London, Chelsea College in 1971. She has held several professional leadership positions, which include Chairman of the Pharmaceutical Manufacturers Group, (PMG) of Manufacturers Association of Nigeria, (MAN). The company, a wholly owned indigenous company, was incorporated in Nigeria in 1984 for the purpose of manufacturing high-quality pharmaceutical products and medical consumables. According to Okoli, the idea to manufacture drugs locally was predicated upon the need to develop local capabilities and competencies, create jobs and provide high-quality pharmaceutical products and services to Nigerians at prices that are not only affordable but represent value. From retail to importation and wholesales of pharmaceutical products, the company commenced pilot manufacturing in 1986. This culminated in the introduction of its flagship brand, Emzor Paracetamol, which currently controls 25 per cent of the analgesic market in the country. Emzor has since continuously expanded its product range, growing in leaps and bounds. It now produces over 60 time-tested products, which include analgesics, vitamins, haematinics, anti-malarials, anti-tussives, antibiotics, anti-helmintics, anti-histamine, antacid, and cardio-protective drugs in Nigeria and in the West Coast of Africa. Emzor Pharmaceuticals has established offices in India, Sierra Leone, Liberia, Ghana, and Mali. The rapid expansion of Emzor Pharmaceuticals has also led to the establishment of several subsidiaries, which includes Zolon Healthcare Limited, Lagos, a specialty health care organisation positioned for the provision of intelligent health care solutions to the needs of the people; this was achieved by building partnerships with world-class health organisations. Specialties in this subsidiary include Cardiology, Endocrinology, Neuropsychiatry, Oncology, Biotechnology, Ophthalmology, Gastroenterology, Obstetrics and Gynaecology, Paediatric and Geriatric Medicine, as well as Health Fairs/Seminars. Emzor Hesco is into partnership with international companies like AESCULAP AG, Germany, providing products like surgical instruments and containers for all surgical needs; orthopaedic implants like plates and screws, targon nailing systems, power drill systems like electric, battery and pneumatic; closure technologies for sutures and surgical specialties; and hospital project business, specifically in the field of surgery. Other partners include Huckerts Laboratory, Belgium, which specialises in safe and effective disinfection of instruments; Medical Research International, Italy, for spirometry, oximetry and telemedicine. This subsidiary provides services for the National Hospital Abuja, Lagos University Teaching Hospital (LUTH), National orthopaedic Hospital (NOH), Igbobi Lagos, Chevron Clinic, Havana Hospital, among others; EMZOR Pharmacy and Stores Limited, a retail and dispensing pharmacy outfit positioned for the delivery of good quality and affordable products and services in the pharmaceutical downstream to Nigerians; Life Gate Medicals Limited, providing specialised training for healthcare workers and medical tourism. On June 12, 2009, Okoli’s efforts at ensuring top quality products paid off as the company received the NIS ISO 9001:2000 certification. In presenting the certificate, the Standards Organisation of Nigeria (SON), remarked that “Emzor Pharmaceuticals Industries Limited had been recognised for excellent performance by numerous awards by different professional bodies. The company has over 60 strong brands, with Emzor Paracetamol having over 25 per cent of the local market share on analgesic in the country,” a statement by SON noted. Indeed, challenges dotted the footpath of Okoli who is saddened by the fact that there has not been enough encouragement in the sector neglected over the years. “You will find out that people have taken their money and put it elsewhere to either trade or do other businesses. 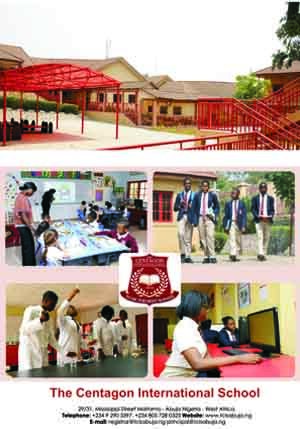 We are, however, planning to revive the sector and we are hopeful that we will be lucky to do this,” she said. To Okoli, having a virile pharmaceutical industry is a form of security for a country in the event of a crisis it means that the country will remain dependent on outsiders for something that is vital to it. Besides, the issue of fake products has remained a hydra-headed problem for the country despite the efforts of the regulators to curb it. Okoli believes that the fake drugs business thrives because there is a gap between the demand and the cost of drugs in the country. This accounts for why foreign firms have capitalised on the gap to flood the country with different drugs. “Look, it is not that they love us; they only saw a loophole and they are doing business, otherwise, why have such companies not come to set up their factories here?” she asked rhetorically, explaining that it has been difficult to fake Emzor products because of the extra mile the company goes to secure its products. Besides, products of the company are everywhere, and readily affordable, which is a disincentive to fakers. Okoli is saddened by the fact that government has not been able to implement the national drug policy that stipulates that 70 per cent of drugs used in the hospitals should come from local manufacturers. Okoli mentors other local manufacturers and encourages aspiring entrepreneurs to invest in the pharmaceutical industry first, as her contribution to building a healthy nation and secondly, in pursuit of Nigeria’s quest for self-sufficiency. But how did she come about her business name? “Oh, it is a combination of my children’s names, Emeka, Uzoma and Edward”, she said. Indeed, Okoli has not only engrained her name and company on the minds of Nigerians, but carved a space for herself in history as a businesswoman of note. Leonard “Leo” Stanley Nnamdi Ekeh was born on February 22, 1956 and he is the chairman of Zinox Technologies Limited. In addition to Zinox, he has been involved with companies Task Systems, Technology Distributions Limited, ICT Brokers, TD Plus, ICT Connect and Buyright AFRICA Dotcom. He was born in Ubomiri Mbaitoli, Imo State to a middle-class family with three brothers and two sisters. His mother was a dietician, and his father was a nurse. He attended Holy Ghost College, Owerri for his secondary education. When young, he wanted to own the biggest transport company in Nigeria. He later went to India for his university education, where he was awarded a Bachelor of Science degree in Economics from Punjab University. Ekeh believes that studying in India was a great turning point in his life because he found the economy of India a realistic economy. After his university education in India, Ekeh opted to study at the Cork City University, Ireland and later transferred to Nottingham University UK, earning a degree in risk management. 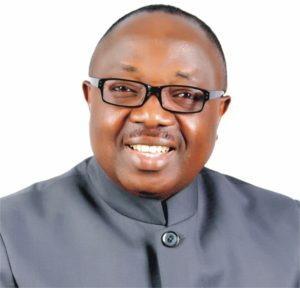 Ekeh through his company Task Systems Limited was one of the few who pioneered Desktop Publishing and Computer Graphics in Nigeria. He computerized 95% of the Print Media, Publishing Houses and Advertising Agencies in Nigeria. Task Systems Limited, his first company has consistently won outstanding industry Awards as Best Partner Award for Compaq, HP, Microsoft, American Power Solution, APC, etc. for 20 years. Mr. Leo Stan Ekeh also pioneered IT Solutions in West Africa through his company ITEC Solutions Limited through which he has delivered the largest IT Solutions ever, from an indigenous firm, to the Nigerian Corporate Market. Mr. Ekeh also pioneered IT Distribution in West Africa through Technology Distributions Limited, TD, which has emerged the Number 1 ICT distribution company in West Africa. TD has consistently won for ten years the highest industry Awards and recognitions for market penetration, revenue, and preferred partner status to become the most decorated ICT Distributor in West Africa. 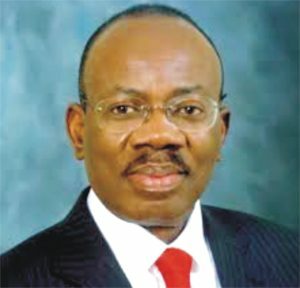 Leo Stan Ekeh has a record of incisive entrepreneurship and his vision to Computerize Nigeria has rewritten the history of Information Technology in the Third World. Ekeh who believes that no one is destined to be poor in this knowledge century has been the main driver of digital knowledge Democracy in Africa. Ekeh as Chairman of the Zinox Group believes one of his legacies is to alter positively the destiny of many poor Nigerians through his knowledge democracy platforms. The most integrated Information Technology Group in the whole of Africa, the Zinox Group has shown multiple competencies in manufacturing, solutions delivery and logistic. The Group salvaged the 2006 Voters’ registration exercise by delivering 12,000 systems to INEC in 3 weeks. Again in 2011, under his leadership, the Group has been responsible for the technology backbone for the 2011 voters’ registration through the supply of 80,000 DDC Machines in 35 days, an awesome accomplishment for an indigenous firm in Nigeria or anywhere in the world. 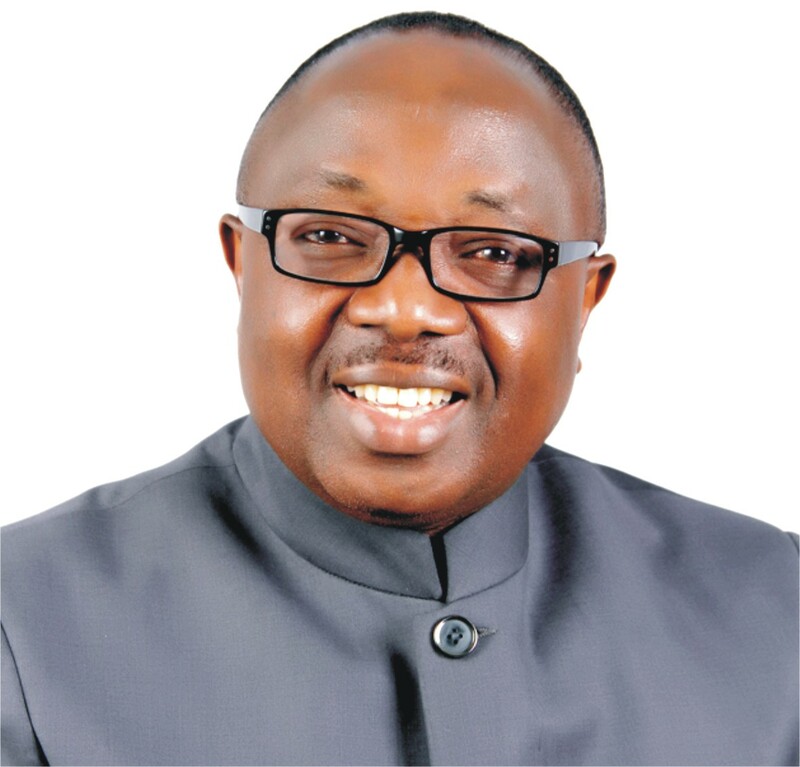 im Ovia was born on November 5, 1951, at Agbor in the Delta State. He attended Southern University Louisiana, where he obtained a B.Sc in Business Administration in the year 1977. Later he proceeded to the North East Louisiana University, where he obtained a Masters Degree in Business Administration in 1979. He also did an Executive Management Program in the Harvard Business School. He is the founder of Zenith Bank Group, a bank he is the largest individual shareholder with about 9.3% stake. Zenith Bank is one of Nigeria’s largest banks. The bank currently has a shareholder base of about one million and is the biggest tier-1 bank in Nigeria. Established in May 1990, it became a public limited company on June 17, 2004 and was listed on the Nigeria Stock Exchange on October 21, 2004. The bank’s shares are traded on the London Stock Exchange (LSE) following a listing of the $850 million worth of its shares at $6.80 each.With its headquarters in Lagos, Nigeria, Zenith Bank has over 500 branches and business offices spread across all states of the Federation and the Federal Capital Territory (FCT), Abuja. Zenith Bank has presence in the United Kingdom, Ghana, Sierra Leone and The Gambia. The Bank also has representative offices in South Africa and China and plans are afoot to take the Zenith franchise to other Sub-African regions as well as the European and Asian markets while consolidating our position as a leading financial service provider in Nigeria and locations where we currently operate. Zenith Bank also has subsidiaries in: Ghana, Zenith Bank (Ghana) Limited; Sierra Leone, Zenith Bank (Sierra Leone) Limited; Gambia, Zenith Bank (Gambia) Limited. The bank also has representative offices in South Africa and The People’s Republic of China. The Bank plans to take the Zenith brand to other African countries as well as the European and Asian markets. He is also an investor in real estate across Nigeria. His other assets include Visafone, a mobile telecommunication outfit. 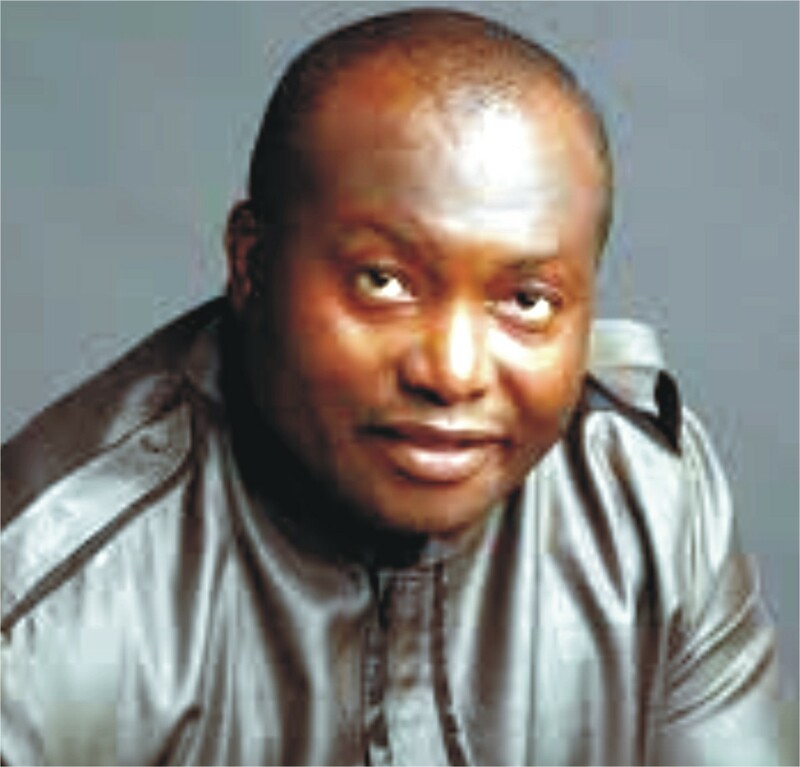 Ifeanyi Ubah is a driven man. Built like a solid rock with boundless energy, he has an effortless capacity to work round the clock. His ability to take tough and far reaching business decisions sometimes 12 hours non-stop marks him out as hard-nosed entrepreneur, tactful and foresighted business mogul of the 21st Century. He is, beyond doubt, a leader in the downstream sector of the oil and gas industry in Nigeria today as the Managing Director/Chief Executive Officer of Capital Oil and Gas Industries Limited. The company has, within a short period of five years, become a flagship in the industry; and is the first among many other blue chip companies of similar and diverse concerns chaired by this hardworking, focused, determined and amiable young man. A man of humble beginning, amiable, likeable and good natured personality, he holds a B.Sc in International Relations and is married to Mrs. Uchenna Ubah, a graduate of Business Administration from Ahmadu Bello University, Zaria. The marriage is blessed with five children. The visionary Chief Executive Officer and Managing Director of Capital Oil & Gas Industries Limited, no doubt, is an ambitious business mogul who, from the very day he joined the oil and gas business, decided to distinguish himself and the company creditably. Through a dint of hard work, personal conviction to succeed, visionary leadership and doggedness, he has, in a matter of six years, between 2003 and 2009, taken Capital Oil and Gas Industries Limited to a vantage position of becoming a dominant leader in the downstream sector of the oil and gas industry in Nigeria. He also sits on the board of several other companies as Chairman, among them are Knoll & Hachfer Engineering Co. Limited. Otunba Subomi Micheal Balogun is a man of excellence, integrity, an exemplary leader and a great reference point to the phrase “All things are possible if you believe”. 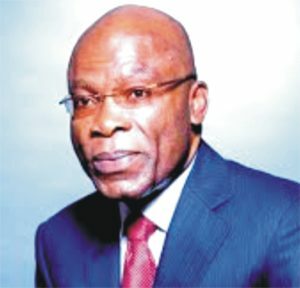 Otunba Subomi Michael Balogun,CON, is the Founder of FCMB Group and a trail blazer and pioneer extraordinaire in the Nigerian financial and business sector. Otunba Subomi Michael Balogun has been referred to as the Grand-master and Baron of the Nigerian Capital and Money Market. He stunned skeptics with his can do attitude and a “no guts, no glory” approach and made history by founding the first Nigerian Bank to be established in Nigeria without foreign direct investments or funding from the Nigerian government. He is the type of man whose story inspires confidence and tenacity; Rather than staying down and remaining vengeful after being unfairly replaced by his employers for a role he more than deserved in a company he had even helped drive to the peak with his expertise and ingenuity; Otunba Subomi Michael Balogun picked himself up and took a giant leap of faith in venturing out on his own. A move that has not only paid off, but today the First City Monument Bank has become a legacy which has now been handed down to the next generation and is currently headed by his son Mr. Ladi Balogun, CEO First City Monument Bank. When you mention courage, tenacity, inventiveness, brilliance, distinction and visionary leadership and all these attributes added to faith, the Baron personifies them all. Born to Muslim parents, Otunba Subomi Micheal Balogun has never been one to shy away from his converted Christian beliefs and unwavering faith and the importance of Godly practices both in his personal walk and business life. This move bears testimony to his courage, independence and willingness to go against the grain. These attributes combined with his resolve to make the best of life and be the best, are part of those that helped him quit his job and set up a bank in a way no one had ever done before and at the age of 42. People of all ages would do good to learn from this; he did not let the fact that he was past the age range in which people believe one can take such risks deter him but went ahead anyway. The Ijebu people have been stereotyped over the years as tight-fisted people, but Otunba Subomi Micheal Balogun has proved this assumption wrong one too many times and continues to do so with his philanthropy.